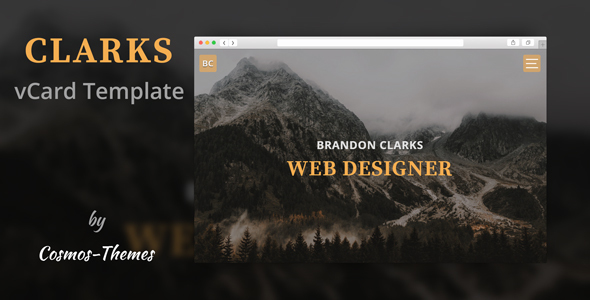 Clarks – is Professional, clean and creative eye-catching Resume/CV & Portfolio Template. It’s a perfect template to promote yourself or your business. You can use this template for vCard, Resume, Portfolio, CV, Photography, Freelancer, Art, Illustration and many more. It has unique stack based animation, 5 color schemes and 17 Homepage Text Animations to choose from. This Template is mobile friendly and designed with modern look and feel while keeping in mind to make it user friendly and eye catching so that people using it can get the best out of their website. All files and code has been well organized and nicely commented for easy to customize. This is a HTML template. Images are only for demo purpose and not included with the download bundle. All images are replaced with placeholder. If you need any help using the file please feel free to contact me via my Themeforest profile contact form. If you have a moment, please rate this item, I’ll appreciate it very much!. Thank you.